In addition to complete coverage of the American College of Physicians' Internal Medicine meeting, readers can find coverage from the Society of Hospital Medicine's annual meeting, including a digest of palliative care, consulting as a career and infectious disease control. Whether they spend time working in hospitals or dealing with hospitalists who care for their patients, ACP members will likely have use for developments presented at the annual meeting of the Society of Hospital Medicine (SHM), held this April in Washington, D.C. Patients at the end of life, facing tough decisions and suffering from many symptoms, particularly need ideal medical care. Unfortunately, they don't always get it, said speakers at an SHM session on palliative care. “We have excellent data [showing] that people suffer at the end of life. Really, end-of-life care is not yet standardized,” said Stephen Bekanich, MD, a hospitalist and medical director of the University of Utah Hospital's palliative care service. One of the basic necessities of effective palliative care is a clear understanding between the patient and physician, said Keith M. Swetz, ACP Member, assistant professor of medicine at the Mayo Clinic in Rochester, Minn. The physician needs to be clear on exactly which interventions the patient wants. For example, the patient may have a do-not-resuscitate order, but still want to receive dialysis and antibiotics. The patient should also understand which benefits to realistically expect from treatment, such as whether an intervention offers any possibility of a cure. Nearly 3 million left ventricular assist devices (LVADs) have been implanted in Americans at this point, so internists can expect more decisions required by dying patients who have them, Dr. Swetz noted. Physicians may be more uncomfortable withdrawing a device than withholding a treatment that a patient doesn't want. But the actions are ethically and legally equivalent, he said. Withdrawing or withholding treatment is also notably different from physician-assisted suicide (which in the U.S. is legal only in Oregon, Washington State and Montana), Dr. Swetz noted, because it's the intent of the action that matters. Still, such actions may be difficult for a physician, in which case it's acceptable to remove oneself, Dr. Swetz said. Clinicians should, however, feel comfortable providing enough pain medication to put patients at ease. It's important to recognize the difference between addiction and pseudoaddiction, which results from insufficient pain control. “That's not the patient's fault; that's our fault for not writing the right orders,” said Howard R. Epstein, ACP Member, a hospitalist and medical director of commercial operations and clinical design for BlueCross and BlueShield of Minnesota. Dr. Epstein offered some clinical pearls for effective pain management in an easy-to-remember form. “Do it by the mouth, do it by the clock and do it by the ladder,” he said. Oral pain medications will simplify patients' transitions to home or a nursing home. He also recommends scheduling pain medications—keeping in mind particularly painful points of the patient's day, like physical therapy—because by the time a patient asks for pain relief and a nurse delivers it, it's already too late, Dr. Epstein said. In addition to the scheduled doses, a set dose (about 10% to 20% of the daily dose) should be available for breakthrough pain. The third step in Dr. Epstein's recommendation refers to the World Health Organization's analgesic ladder (available online) which suggests types of drugs to use for pain. Dr. Epstein offered an additional piece of advice on drug choice: Keep it simple. “Try to use one medication and titrate it up,” he said. He and co-presenter Stephanie Grossman, ACP Member, also recommended using an equianalgesic table to calculate appropriate doses, noting that it's important to be careful with the math. Dr. Grossman, director of palliative care at Emory University Hospital in Atlanta, suggests collaborating with colleagues to prevent mistakes. Consulting on the care of patients admitted to other subspecialties has become a routine task for many hospitalists. Yet most physicians have had little training, if any, on how to be a consultant, according to Geno J. Merli, FACP. “It's just assumed that we're all good at this, and you know what, we're not all good at it,” said Dr. Merli, who is a professor of medicine and chief medical officer at Thomas Jefferson University Hospital in Philadelphia. Promptness and communication matter, according to Dr. Merli. Rapid response may sometimes be inconvenient for a consultant, but a delay could extend length of stay and negatively impact patient care, he said. Effective communication is another key, beginning with a clear understanding of the reason for the consult, Dr. Merli said. He recommends communicating with the attending, but acknowledged that sometimes it's necessary to work through residents. Although a consultant's report should be simple, the evaluation should be thorough, including a good history, physical and review of pertinent medical records, Dr. Merli advised. The medical consult should be designed to prevent not only an avoidable bad outcome (and possible resulting lawsuit), but also the necessity of rescheduling surgery at the last minute because a medication wasn't stopped or a patient's blood sugar was too high, for example. Often effective consulting will require additional involvement after surgery. This possibility should be addressed in the consultant's report, with a note like “I will reassess the status with you.” Of course, once you write that, then you're obligated to keep on top of the case. “When you've built a big consult service, it could be as big as your medical service. The weekends could become brutal managing the follow-up,” warned Dr. Merli. One of the recent concerns in infectious disease has been the emergence of vancomycin-resistant types of Staphylococcus aureus, known as VISA (vancomycin-intermediate) and VRSA (vancomycin-resistant). 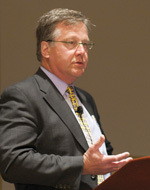 To help physicians determine appropriate treatment, labs should be able to provide accurate minimal inhibitory concentrations (MICs), assuming that they're using the latest technology, said James C. Pile, FACP, interim division director of hospital medicine at Case Western Reserve University/MetroHealth Medical Center in Cleveland. Otherwise, physicians should be suspicious of the findings. Getting an accurate MIC matters because the number predicts the likelihood of treatment failure with vancomycin; one study found that rates ranged from 20% failure at an MIC of 0.5 to 50% at a score of 2 (which is still considered sensitive). Once you've got the MIC, you can determine the correct vancomycin dose. Citing guidelines published in Clinical Infectious Diseases last year, Dr. Pile called for getting fairly aggressive. Evidence is still lacking, but the guidelines, based on expert opinion, call for patients with normal renal function to get an initial dose of 15 mg every 8 hours or 20 mg every 12 hours; for critically ill patients, a loading dose of 25 to 30 mg may be considered. “We need to avoid troughs less than 10 mcg/mL because there's a growing sense that this has helped to drive tolerance,” said Dr. Pile. However, the downside of these higher doses is greater risk of side effects. Significant nephrotoxicity can occur, and a recent study found irreversible ototoxicity in older patients who take the drug for two weeks or more, he warned. Clearly then, vancomycin leaves room for improvement in the treatment of MRSA. “For an MIC of 2, at least in serious infections, consider choosing another agent,” suggested Dr. Pile. He noted, however, that there's no guidance, and not much evidence, to support agents besides vancomycin. But there is some hope in the pipeline, provided particularly by the fifth-generation cephalosporins, some of which could come on the market as soon as this year. In the wake of recent reports that Clostridium difficile (C. diff) had overtaken methicillin-resistant Staphylococcus aureus (MRSA) as the top hospital-acquired infection, the time was ripe for a review of C. diff treatment and management at the SHM meeting. The main symptoms of C. diff are diarrhea and colitis, often preceded by antibiotic exposure, so it can be difficult to distinguish C. diff from other kinds of diarrheal illness, noted session speaker John Bartlett, MACP, a professor of medicine at Johns Hopkins University School of Medicine in Baltimore. With antibiotic-associated diarrhea, the symptoms get better when the antibiotic dose is lowered. If the drug is stopped, the symptoms go away. With C. diff, stopping the drug only works about 30% of the time. Also, C. diff often carries distinct signs of colitis like cramps, fever and leukocytosis, he said. Another clinical feature? A distinctive, sickeningly sweet stool odor that some have likened to horse manure. Dr. Bartlett uses the odor as a tool for diagnosing patients with diarrhea who previously had C. diff, to help determine if they might be having a relapse. “If they report that the smell is back, then that sends a signal. And if they say the smell was there before but it's not the same this time, then it's probably not a real relapse,” he said. Fluoroquinolone and cephalosporin are the number one and two culprits in terms of antibiotics that cause C. diff, Dr. Bartlett said. The inducing agent clearly needs to be stopped in the patient with suspected C. diff, and a different antimicrobial used to treat whatever condition necessitated an antibiotic to begin with. The “big three” inducing agents, which should be avoided as alternative antibiotics for a patient with C. diff, are clindamycin, broad-spectrum beta-lactams and fluoroquinolones. Non-inducing agents are urinary antiseptics, sulfonamides, and any agents without antibacterial activity. If it's not possible to pick a non-inducing agent, the following carry a lower induction risk than the “big three”: narrow spectrum beta-lactams, macrolides, tetracyclines, aminoglycosides, anti-staph drugs, metronidazole, trimethoprim/sulfamethoxazole (TMP/SMX), vancomycin and rifampin. Some patients may not like certain of these alternative drugs, based on past experience, Dr. Bartlett said. “I give every patient this list” of the various inducing agents, and they can say what they like and don't like, he said.